* More news on child labor in China. SHANGHAI — China said Wednesday that it had broken up a child labor ring that forced children from poor, inland areas to work in booming coastal cities, acknowledging that severe labor abuses extended into the heart of its export economy. Authorities in southern China’s Guangdong Province, near Hong Kong, said they had made several arrests and had already “rescued” more than 100 children from factories in the city of Dongguan, one of the country’s largest manufacturing centers for electronics and consumer goods sold around the world. The officials said they were investigating reports that hundreds of other rural children had been lured or forced into captive, almost slavelike conditions for minimal pay. 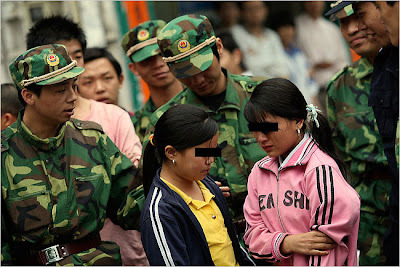 The children, mostly between the ages of 13 and 15, were often tricked or kidnapped by employment agencies in an impoverished part of western Sichuan Province called Liangshan and then sent to factory towns in Guangdong, where they were sometimes forced to work 300 hours a month, according to government officials and accounts from the state-owned media. The legal working age in China is 16. The labor scandal is the latest embarrassment for China as it prepares to host the Olympic Games this summer. For much of the past year, the country has been plagued by damaging reports about severe pollution, dangerous exports, riots in Tibet and the ensuing disruptions to its Olympic torch relay by Tibet’s sympathizers, among other groups. The abuses may also reflect the combined pressures of worker shortages, high inflation and a rising currency that have reduced profit margins of some Chinese factories and forced them to scramble for an edge — even an illegal one — to stay competitive. The child labor ring, which was first uncovered by Southern Metropolis, a crusading newspaper based in Guangzhou, came less than a year after China was rocked by exposure of a similar problem in a less developed part of central China. Last June, labor officials in Shanxi and Henan Provinces said they had rescued hundreds of people, including children, from slave labor conditions in rural brick kilns. Many of those workers said they had been kidnapped. The earlier case, which local officials initially sought to keep quiet, set off a national uproar in China and prompted a sharp response from President Hu Jintao, who vowed a broad crackdown on labor abuses. Local officials in Guangdong may have moved quickly to acknowledge the latest incident to keep it from becoming a running scandal as the Olympics approach. In recent years, Beijing has stepped up its efforts to crack down on child labor and labor law violations. Last August, Beijing revoked the license of a factory accused of using child labor to produce Olympic merchandise. Several other suppliers were also punished for labor law violations. But experts say rising costs of labor, energy and raw material, and labor shortages in some parts of southern China have forced some factory owners to cut costs or find new sources of cheap labor, including child labor. Even factories that supply global companies, including Wal-Mart Stores, have been accused in recent years of using child labor and violating local labor laws. Big corporations have stepped up inspections of factories that produce goods for them. But suppliers have become adept at evading such scrutiny by providing fake wage and work schedule data that suggest they abide by labor laws. Experts say the labor problems discovered in Dongguan are not uncommon.